I know these are considered a "fancy" French food, but they are so simple to make. My kids start cooking them when they are about 7 years. 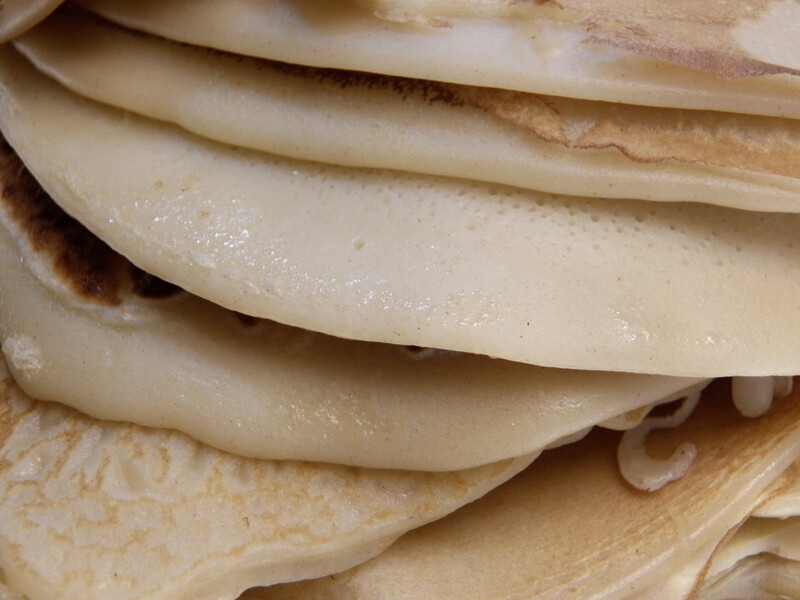 If you can make pancakes, you can make crepes. Also, unlike pancakes, crepes can be kept and re-heated and still taste very good. 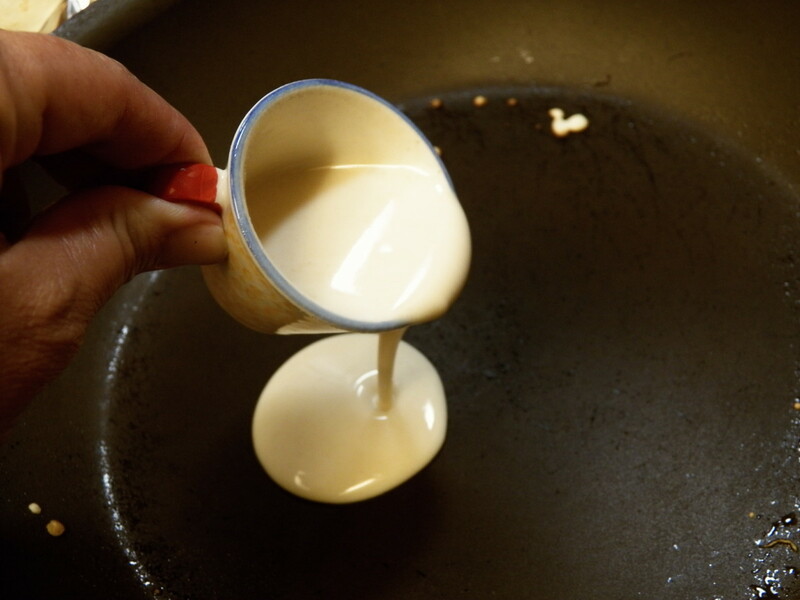 Traditional crepe recipes have oil, but I've discovered that you really don't need it. See below for how to make crepes. They can be put in the refrigerator for a week or frozen. This recipe makes 16 crepes which are about 50 calories each. Put the crepes on a plate. Put about 2 TB to 1/4 cup of fruit or fruit filling and a squeeze of whip topping, roll up and put seam side down. 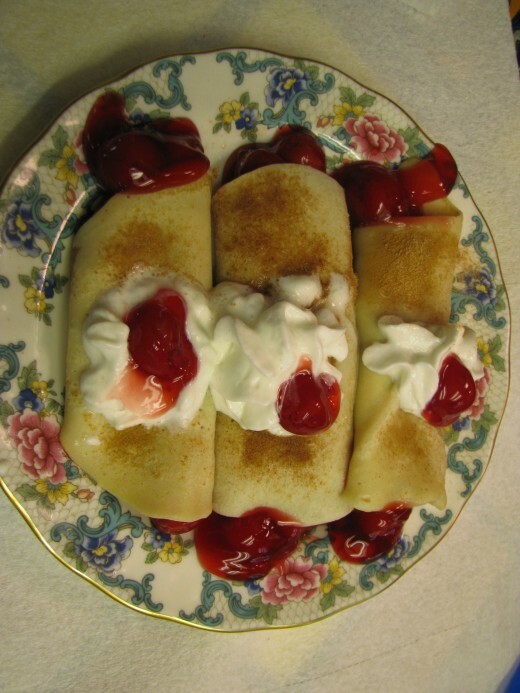 Top with more whip topping, fruit and a sprinkle of cinnamon sugar (the three crepes pictured above are less than 300 calories!). 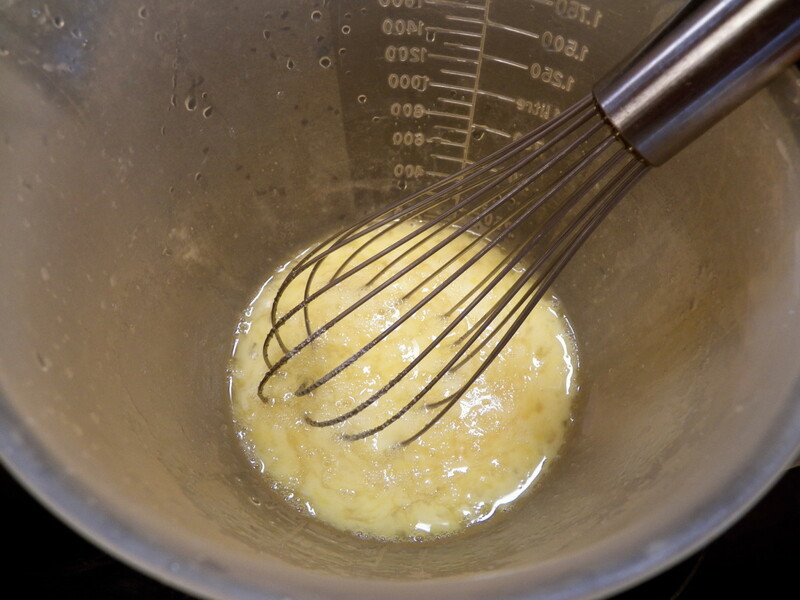 Mix togeter 2 eggs, 1 cup flour and 1/2 cup milk with wire wisk until very smooth. 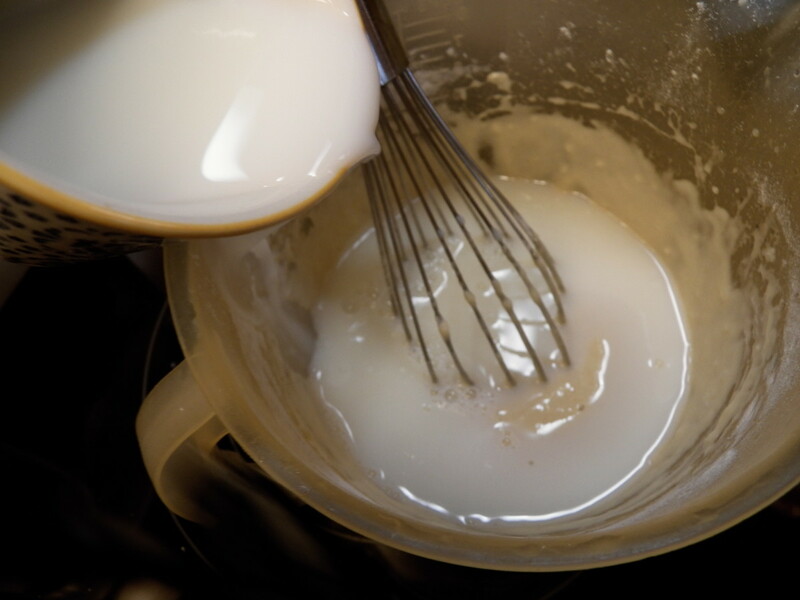 Add remaining 1 cup milk and salt and mix. 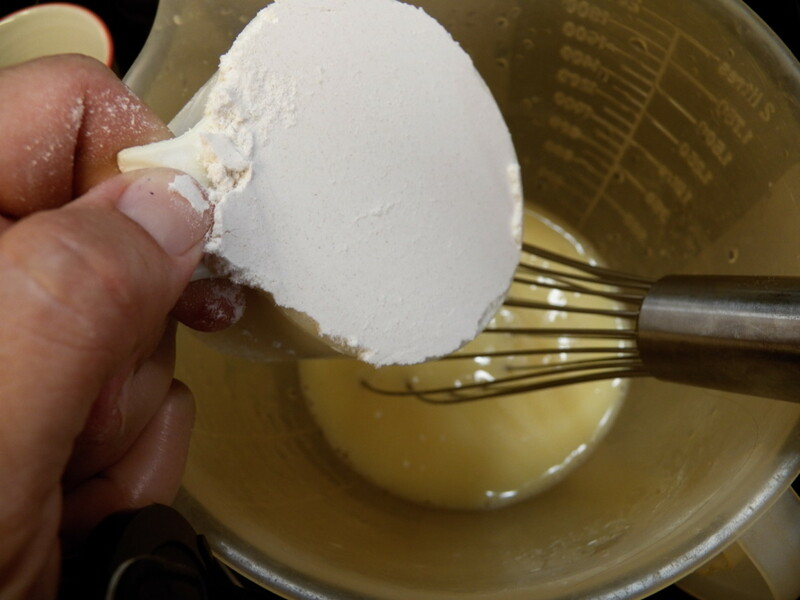 If you have time, let set for 20 minutes (or overnight) so that flour absorbs liquid and crepes cook more easily. Cook crepes one at a time. Spray non-stick butter spray on pan at medium heat. 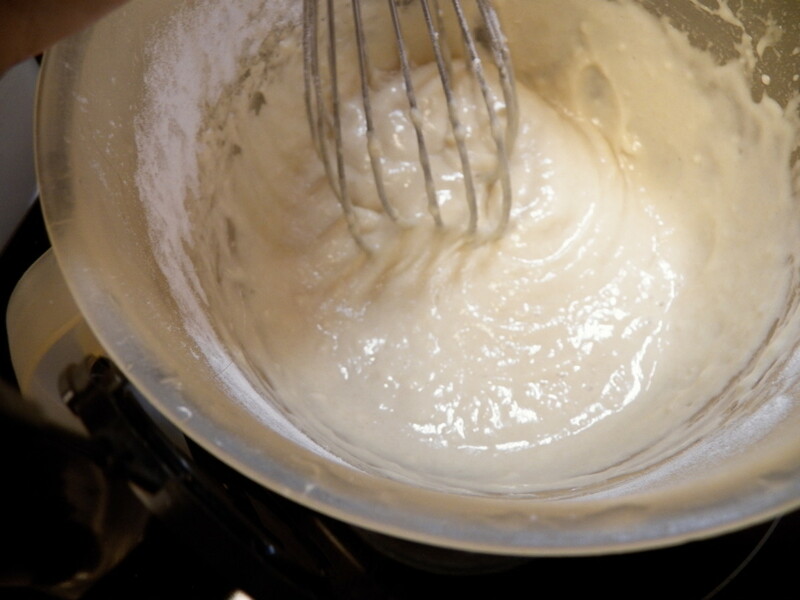 Pour 1/4 cup of batter in pan. Lift and swirl pan to spread out the crepes if you want it thinner. 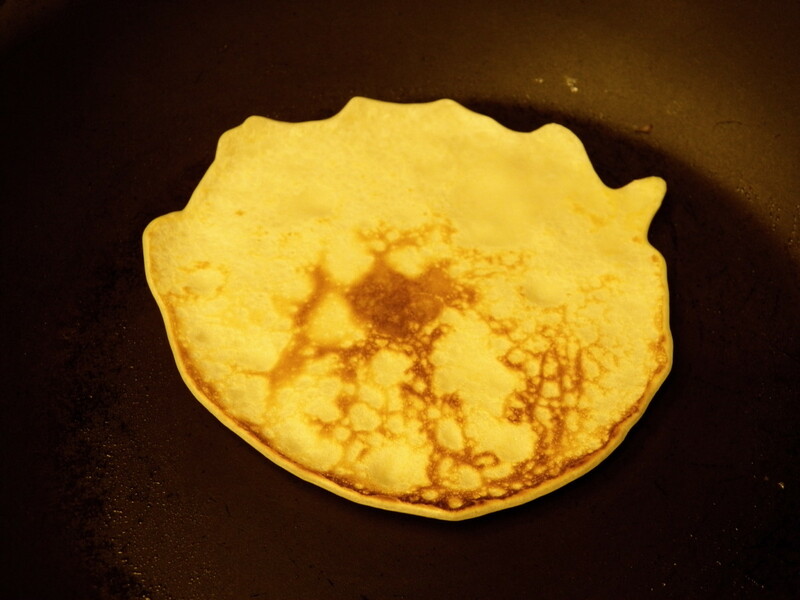 Cook until middle of crepe is no longer liquid. 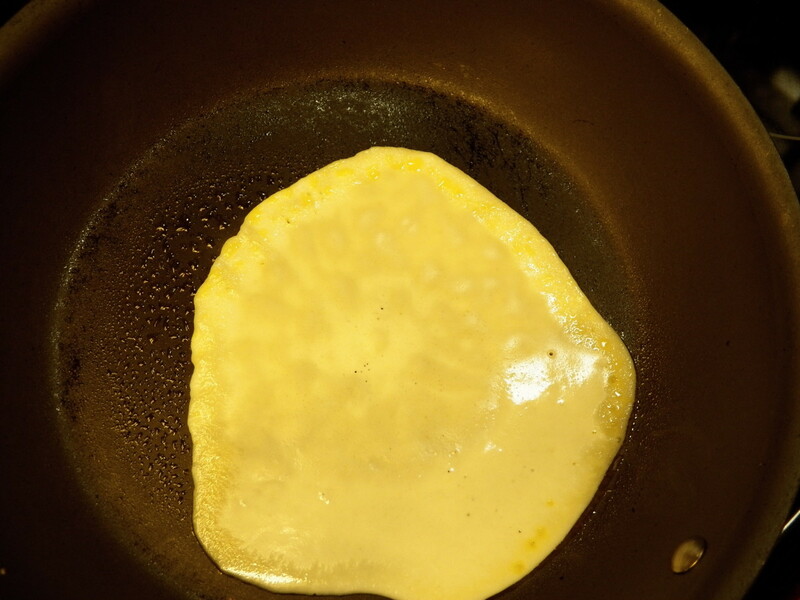 Turn crepe over and cook just a few seconds until lighly done. Lift and stack on a plate (no need to separate them, they will not stick). 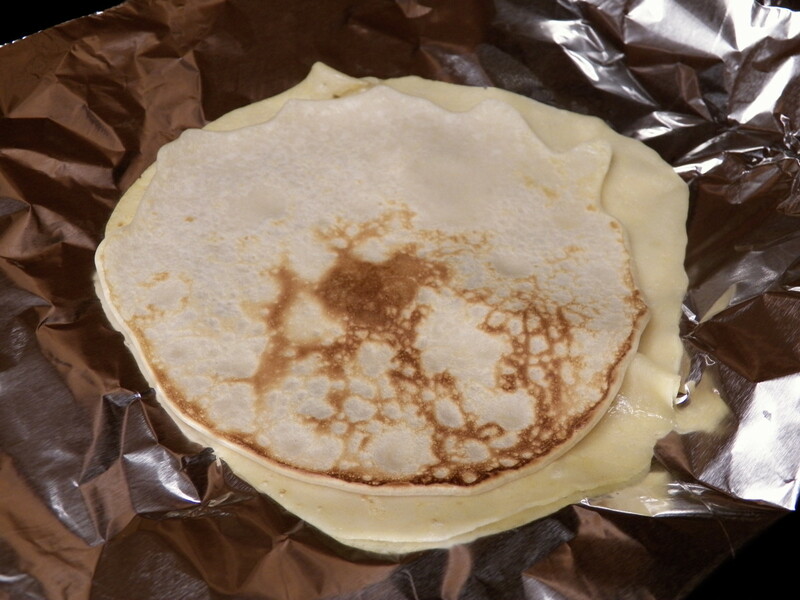 Storing Crepes: Wrap crepes in foil and store in refrigerator for 4-5 days, or freeze for up to 6 weeks. To use frozen crepes, just let them defrost and eat them either cold or heated up in the microwave. You won't know they were frozen! Instructions: Toast the bread and put egg, cheese and bacon inside. 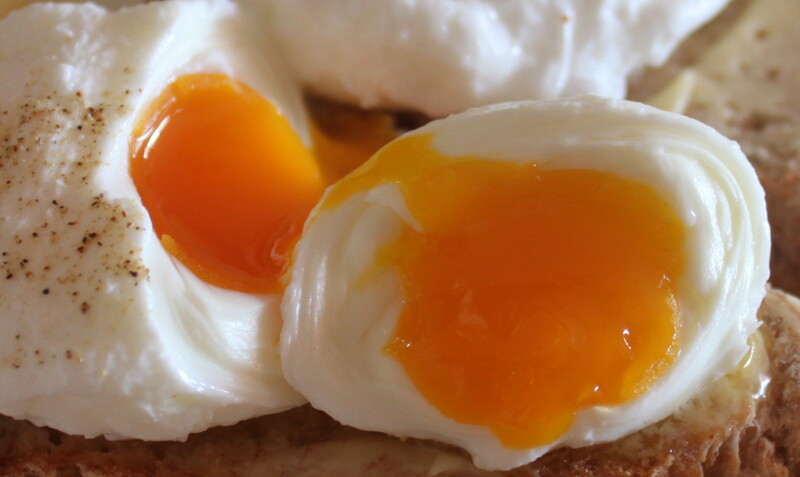 As pictured, the egg sandwich is under 300 calories. I love a good coffee in the morning (and I make a decaf at night a lot too), but I'm also very lazy. I came up with this easy but very low calorie way to make a foamy cappuccino. I love those coffee creamers with flavor but when I started actually measuring them out, I realized that I was using a lot of calories to get a good taste. I know that I do need to drink milk every day so I use my morning coffee to help me do that. You can use brewed coffee, but instant tastes good too and it is fast! optional: 2 TB sugar free coffee flavoring (I found these at the dollar store and the grocery store--no calories! You can also use the flavored Splendas). A lot of times, I'll make this as a treat in the evening too. It makes me feel like I'm not on a diet and that I'm having a treat. When I'm pressed for time, or want something different, I just put some fat-free Reddi whip on top instead of foaming it. Lots of the restaurants are starting to put this on the menu as a healthy breakfast item, but most of them make the rolled oats which are very mushy. Try buying Old Fashioned Oatmeal instead. It doesn't take much longer to cook and has a much nicer texture. I make a serving in the microwave in just 2 minutes. Put everything in a microwave safe bowl and cook in the microwave for 2 minutes. 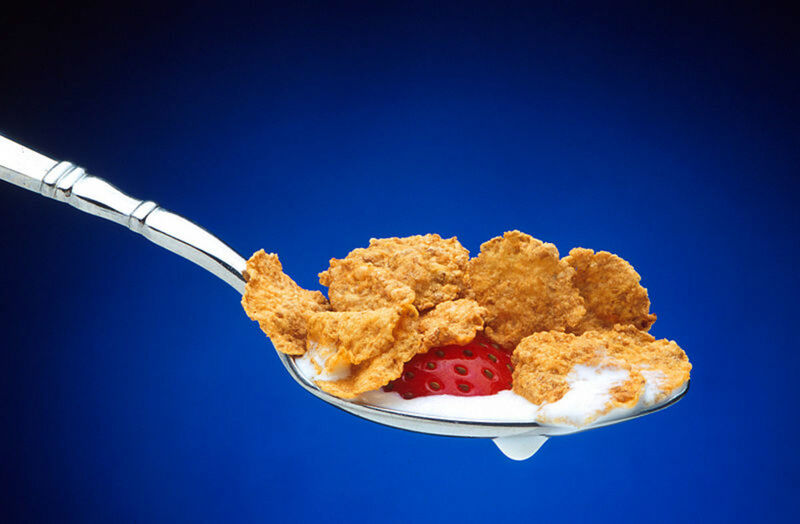 Pour on a 1/4 cup of milk to eat. 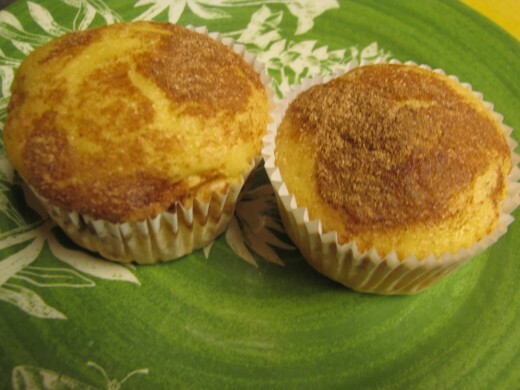 You can sprinkle with a little cinnamon sugar or brown sugar or Splenda if you want it a little sweeter. This makes a great winter breakfast--very filling. either: 1 small can of pumpkin (for pumpkin muffins) or 1 cup of Applesauce and 2 cups of chopped apples (for apple muffins), or 1 cup apple sauce and 2 mashed bananas (for banana muffins). Instructions: Mix all the ingredients together. Put in muffin cups and bake at 350 degrees for about 15 minutes, until done. Each muffin is under 100 calories. You can probably use other mashed fruits too, like mandarin oranges or peaches. About 2 cups of mashed fruit should be about right. You can have half of that fruit be apple sauce, as I do here. Nature's Own 100% whole Wheat and Double Fiber: A regular slice of most breads is 70 calories. There are several brands of bread which advertise slices of 35-45 calories, but these are generally just smaller slices. Nature's Own has managed to make a couple of different breads that are just 50 calories a slice, but are otherwise just like a regular slice of bread. That seems like a bargain to me! In fact, I often will have a slice of bread, Promise fat-free butter and a sprinkle of cinnamon sugar as a snack. Bread fills me up and is one of my favorite foods, so this really helps me to feel that I'm not deprived. 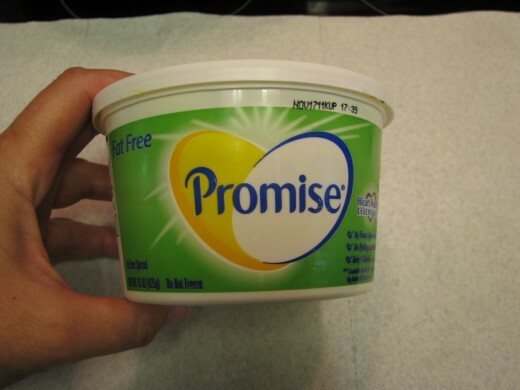 Promise Fat-Free Butter and other Butter Substitutes: Let's face it, Fat-free butter does not taste like real butter, but at 5 calories a Tablespoon, I can use as much as I want. There are other fat-free butter products like Crisco spray that can give a butter flavor to foods and that really helps them taste better. 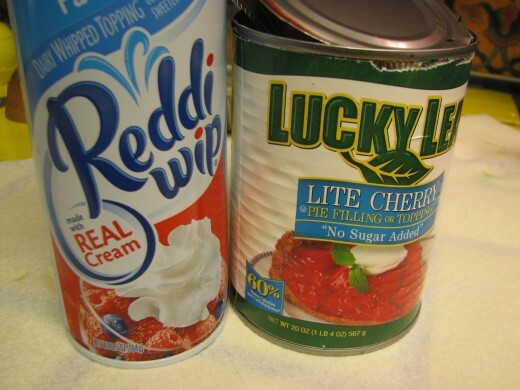 Fat-Free Reddi Whip: You can't let this sit too long, but if you eat it right after spraying, it really tastes good and is only 5 calories a serving. Whipped cream is one of my favorite foods, so putting this on crepes or on top of coffee makes a real treat. Cinnamon Sugar with a tiny spoon: Ok, this is sugar, and generally sugar is not considered a diet food, but if you use this as a sprinkle of a 1/2 teaspoon on top of cappuchino foam, bread, muffins or crepes you get the taste of sugar but only about 8 calories. A bargain! Sugar Free Cherry or Apple Pie Filling: At only 35 calories for 1/4 cup, this is a very tasty treat to put in crepes or on top of pancakes. Sugar Free Cake Mix: I actually bought this the first time by accident, but when I saw the sugar free label, I wondered if I could make muffins with it using a recipe a friend had given for fat free muffins. It worked and the muffins are under 100 calories. 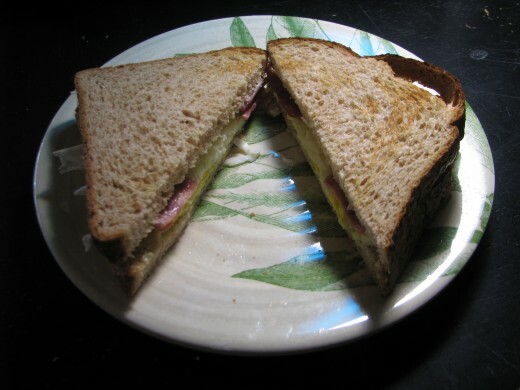 Turkey Bacon: My mom bought this for my kids when she was visiting and it has quickly become a family favorite. I actually never bought any bacon before because it always seemed like it was too fattening. But turkey bacon (and turkey sausage, which I also have started buying) is very low in calories but high in taste. We eat this by itself, in an egg sandwich or in an omelet. Sister--I absolutely understand what you mean. I didn't exactly explain it in this hub but one of the things My FitnessPal has helped me do is to keep track of my calories--I want to eat a meal of about 300-400 calories so that I can have 100-200 calories to eat in between meals. I've gotten a list of snacks that I like to eat that are all under 100 calories and are quick to pick up and eat on the go. I list those in my diet foods hub. Everybody will have a different snack favorites list, but for me it is reallly helpful to have those ready to go so I don't eat something with too many calories! Thank you so much for writing this hub! Recently I have been trying to lose weight, and my big problems are the energy levels. How can I get quick energy food and not eat a candy bar? How can I walk/jog and not "steal" snacks from my own fridge? This helps a lot. Thank you. The picture looked so delicious that I had to read the article. Nice ideas. I'm so glad you liked some of these. I also love to eat Old Fashioned oatmeal--more crunchy. I make it in the microwave and put cut up apples in it too, along with some dried fruit and a couple of cut up pecans. I should have put that in the hub since it is my favorite breakfast! Thanks so much ytsenoh! I actually have started making hash browns without using any oil and they are great. Yesterday, I made them in my pannini maker! Great hub. I am always looking for something tasty to cook for breakfast - especially at weekends, but at the moment I am trying to watch my calorie intake. 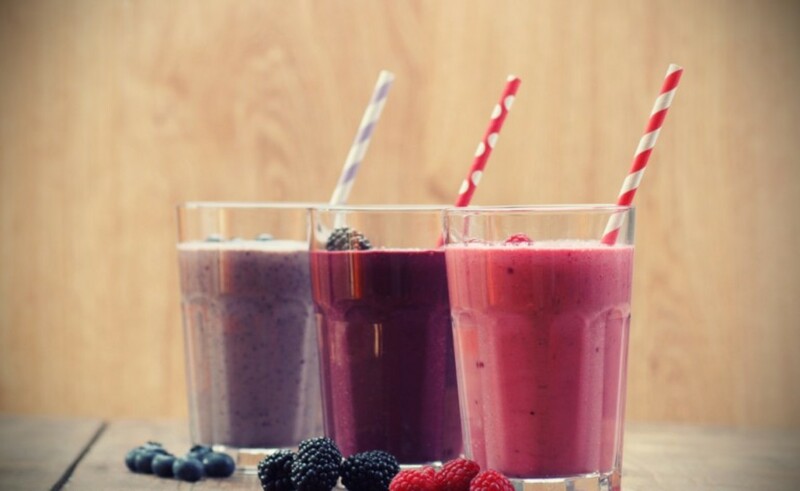 Yummy, yummy, yum! I guess I shouldn't share that I had fried potatoes and sausage gravy for breakfast today! 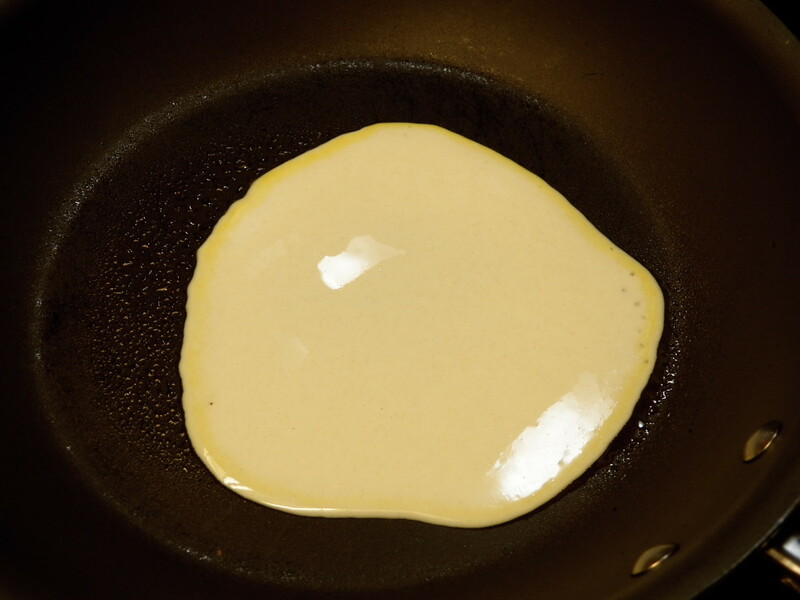 Your image made it look so easy and from the looks of your crepe recipe, it appears so. Thank you for sharing your recipe and ideas. Very useful because anything fat free or sugar free is much healthier.